If you ever get invited by short game guru Dave Pelz to enjoy dinner at his Austin, Texas home, make sure to bring your golf clubs. In his back yard, Pelz has full-scale replicas of several famous golf greens. When you step onto his veranda, you will see the Augusta National’s 12th green on your left. A few steps away is the 17th at TPC Sawgrass, complete with a generous moat ringing the putting surface. Pelz also has installed Pebble Beach’s 14th green in the surrounding scrublands and an assortment of bunkers and multitiered practice greens on his property. The turf is a synthetic grass system that stays forever green and never needs to be mowed. When it comes to the best way to practice your golf swing at home, the good news is you do not have to go to Dave Pelz extremes to benefit your game. 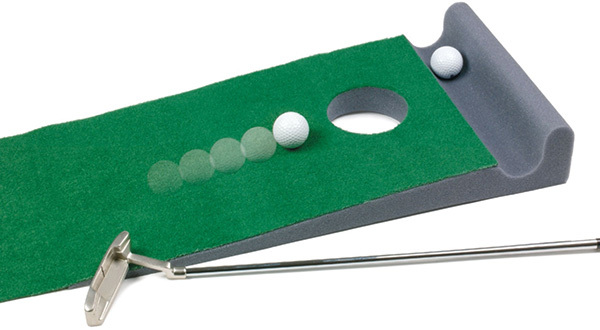 Golf practice gadgets have come a long way from the days of the electric putting partner that could be set up at one end of the family room to practice putting (although those are still great). Golfers can now augment those systems with putting mats, some of which even come with contours. When you want to build a little muscle memory for your putting stroke after spotting something on television that a pro is trying, there are alignment rods you can put down to guide the stroke. 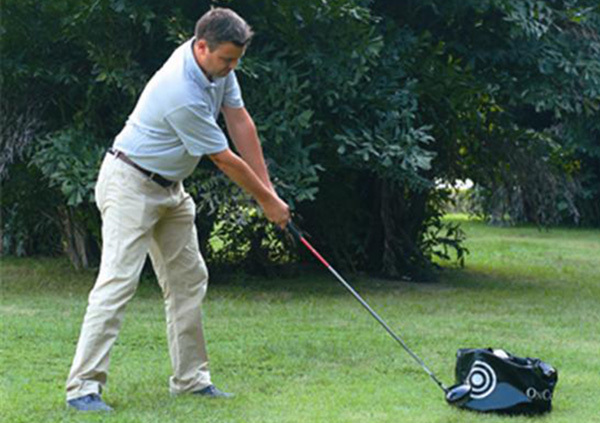 For your full swing, there is the OnCourse Strike Zone Bag that can be filled with rags and old towels to help groove a shoulder-and-hip movement. Home golf simulators have also come a long way in the 21st century. These days an indoor golf room can be constructed in a space that a couple of exercise bikes would take up. 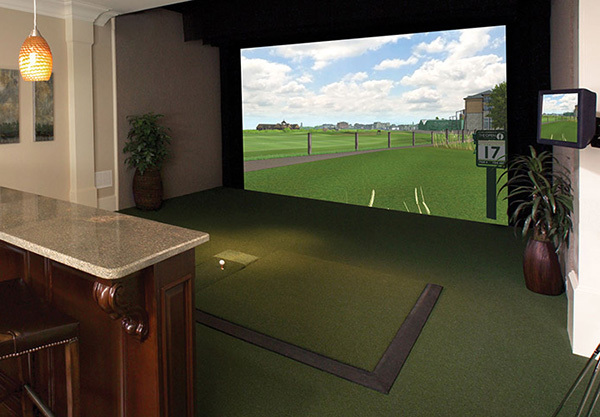 A simulator can work by hitting balls into a screen or with a mat and high-quality hitting net. Packed with infrared sensors these systems allow golfers to play world-famous courses, hit off uneven lies, golf in adverse weather conditions and compete against friends. There are far more benefits to mindful practicing at home than most golfers realize. The properly executed pitch shot requires the same swing as a full shot, and there is no better way to build tempo than working on the pitch shot. A collapsible chipping net is portable, sets up instantly and provides three different, and increasingly smaller targets, to hone your short game. The evolution of practice golf balls has also kept pace with modern technology. There are still bags of plastic wiffle balls that can be whacked safely around the backyard. 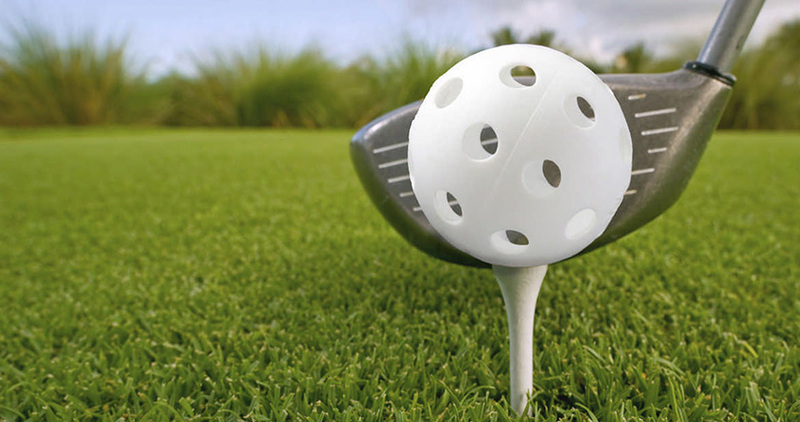 Or opt for solid foam golf balls and “soft-flite” balls to simulate the flight of real golf balls on the course without inflicting damage around the yard while delivering close to the experience of hitting an actual ball. A synthetic backyard putting green will cost, on average, between $15 and $25 per square foot to install, depending on the size and location and complexity. Backyard greens can be installed to include a fringe and collar of rough as well to provide chipping practice under course conditions. On these greens putts roll true and, as any golfer will tell you, there is nothing that builds confidence more than watching a putt roll into the hole. A backyard putting green can be just the beginning. The technology of synthetic turf has advanced to the point that a small pitching green in the yard will accept full shots and check up when delivered from a well-struck iron. Small bunkers – no need to simulate the sand – can also be installed. These days you don’t even need a backyard to engage in meaningful golf practice at home. Apartment dwellers can take advantage of portable putting greens that fit on the balcony and offer the performance of real grass on regulation-sized cups. Mastering putting and chipping those testy 15-footers often makes the difference between leaving the course happy and shaking your fist at another round that got away. Next story What Are Golf Balls Made Out Of?